Traveling through the Beagle Channel and the mind-boggling Glacier Alley, lined with imposing glaciers named after Spain, Romanche, Germany, Italy, France and Holland. Trekking through Ainsworth Bay to see an impressive beaver dam and the unforgettable Marinelli Glacier. Hiking through the unrivaled Torres del Paine National Park, with its ancient forests and colorful, tranquil lakes. Sampling delicate, delicious and boutique wines during a tour of the Casablanca Valley. Discovering the majesty of Tierra del Fuego, and embarking on a train journey to the end of the world. Glimpsing the Argentine gaucho culture in the Pampas with a folklore and gaucho show along with a traditional asado; a delicious barbecue meal. Marveling at the intricate footwork of tango dancers at a prestigious show in Buenos Aires, performed by the most talented in the city. Traverse the bottom of the map with Yampu’s Ends of the Earth Patagonia Cruise from Chile to Argentina experience! The Stella and the Via are the expedition cruise ships of Patagonia Cruises in the waters off Patagonia (900,000 square kilometers in the south portion of the continent) and Tierra del Fuego (at the very bottom of Patagonia). From your outside cabin, you will see spectacular views of glaciers, forests and mountains as we cross from Chile to Argentina. Yampu travelers will also tour Santiago and Buenos Aires. Prior to the cruise we will visit the towering granite “cuernos” or horns as they are called in Torres del Paine National Park, and which are perhaps the best-known image of Chile. Enormous glaciers mark the northern boundary of the park. This is the southern extreme of the Patagonia Ice field– the world’s largest. We will also spend two days in Santiago to visit this fascinating and modern city. Near Santiago we may visit Vina del Mar and Valparaiso, Valle Nevado, Isla Negra and the Pablo Neruda Museum or the wineries Cousiño Macul winery and Concha y Toro. Trip ends in Buenos Aires, Argentina, we will spend three fantastic days touring this cosmopolitan city. Prices include airfare from Santiago to Punta Arenas, airfare from Ushuaia to Buenos Aires, hotel accommodation with daily continental breakfast, cabin accommodation on Mare or Via Australis including all meals and activities, guided tours in English including all entrance fees, all transfers between airports and hotels with assistance and baggage handling; meals where specified. Local airport taxes that are payable in the country of destination are not included. Taxes and security fees that can be paid at time of ticketing are already included. *By traveling to Patagonian Chile with Yampu Tours, you will be making the choice to travel responsibly. 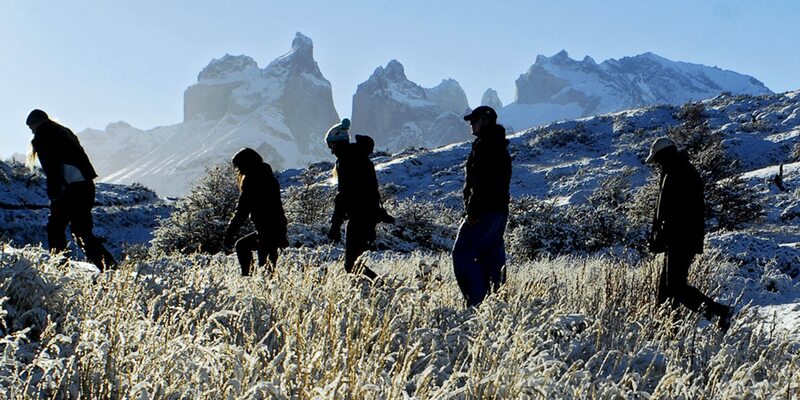 Working with Reforest Patagonia, Yampu Tours will donate one tree for every client booked to the Chilean Patagonia, towards the reforestation efforts in Torres del Paine. Reforest Patagonia is a non-profit, public-private alliance with a single objective: to recover one of the world’s most important ecosystems. One of the main attractions of the renowned Torres del Paine National Park, these rock formations are 1,000 meters of naked granite stabbing the heavens with three colossal towers. The trail penetrates a valley covered in forests, streams, slopes and wildlife. This beautiful trail tours through a diversity of local plants such as the Notro, which blossoms powerful red flowers in November and December. Along the trail there is a peaceful lagoon usually inhabited by a family of caiquenes (wild upland geese). The day starts off in a vehicle. Driving through the length of the park, we reach the Grey Lake and the National Park Torres del Paine. Guanacos, foxes and birds are sighted along the way. This is an excellent excursion to see the park as a whole. Once at Grey Lake, our guide will explain how glaciers have sculpted the entire region. Along the way, we may see extraordinary icebergs that have broken off the main glacier. The inner roads of the park will delight the passenger with its beauties until Salto Grande is reached. A short walk leads to this waterfall which flows into the turquoise waters of Lake Pehoe. This light path borders Mount Almirante Nieto, passes the romantic Luguna Inge and reaches the emerald-green Lake Nordenskjold. The path promises a soft walk or a pleasurable ride among powerful nature. The lake extends to the foot of the colossal mountain Almirante Nieto. Cost: $35-100 per person, to be paid directly at the hosteria. Reception at Santiago airport and transfer to the selected hotel in the heart of the city. This afternoon, enjoy a private city tour of Santiago. The tour begins from the Funicular de Santiago (Gondola), which provides a stunning and panoramic view over the city from the top of San Cristobal Hill. Travel to the heart of the city and Plaza de Armas the spot from where the city has grown throughout the centuries. Each Latin city has a plaza de Armas as when cities were founded the center was also where the armory and military base was established - hence the name Plaza de Armas (Plaza of Arms). Visit some of the more important buildings such as the Cathedral, the City Council, the Central Post Office and the National Historical Museum. Continue to the Presidential Palace La Moneda; the current seat of the government. Wander the streets that were once elegant at the beginning of the 19th century and now are a commercial center. One will also visit some the original colonial neighborhoods such as Concha y Toro Square. Characterized by its cobbled streets and old mansions that reflect the elegance and richness of the early twentieth century the neighborhood grew to prominence between 1870 and 1876 with the influx of wealth as a result of mining and the discovery of Silver. Many Chileans achieved great wealth, including Enrique Concha y Toro founder of the famed winery. Return to the hotel for the evening. This morning, be met at the hotel and transferred to the Casablanca Valley, approximately 50-miles (80-kilometers) from Santiago. The Casablanca Valley is one of Chile’s most important regions for cultivating the grapes that produce crisp white wines, most notably Sauvignon Blanc and Chardonnay. Here, one will enjoy a tour, tasting and lunch at one of the local wineries situated along this thriving wine route. After lunch, leaving the Casablanca Valley, visit Valparaiso, the oldest and most important port in Chile. Here is where one will have an opportunity to walk along the city’s winding streets and enjoy the scenery and culture of this charming port-city. We continue to Vina del Mar, a resort city that was founded in 1874, famous for its beautiful gardens and flower clock. Late in the afternoon return to the hotel in Santiago. Lunch is included today. Transfer to the airport to take the flight to Punta Arenas. Reception at the airport and transfer to the all-inclusive Torres del Paine hotel. Upon arrival, be meet with the guide to go over program preferences for the following days. Settle in and spend the remainder of the evening at leisure to enjoy dinner with a lovely house wine. Note: If staying at Las Torres, one will visit a Patagonia estancia complete with BBQ snack en-route to the hotel. If staying at Explora, stop to have a light meal in a restaurant on the way. If staying at any of the other hotels, go directly from the airport to the hotel. Please be aware that Explora operates on a fixed entry and departure calendar. Please inquire with a Yampu Travel Consultant for details. Enjoy Torres del Paine, and take advantage of the beautiful surroundings. One may choose to horseback ride, kayak, hike the trails, or enjoy the hotel’s amenities. Enjoy a dinner infused of local flavor with a modern twist accompanied by regional wines. Morning of leisure. Afternoon, transfer to Punta Arenas. Upon arrival, transfer to the hotel. Transfer to the port to embark on the expedition cruise ship Stella or the Via (Saturday or Tuesday only). The ship will begin boarding at 6 pm and the captain and crew will give a welcome cocktail reception on board. Immediately afterward, the ship will set sail for the uttermost part of the earth. Through the Strait of Magellan, travel to Southern Patagonia, including Tierra de Fuego. This is the beginning of a great adventure! During the dawn’s early light, the ship will continue navigating through Almirantazgo Inlet, until arriving near Marinelli Glacier in Ainsworth Bay, where travelers will enjoy a walk to discover a beaver dam in the midst of a marvelous Magellanic forest. On the beach, observe a colony of elephant seals. Continuing the voyage, reach Brookes Glacier Bay, which is surrounded by several glaciers, providing an awe-inspiring spectacle. Here, walk near Brookes Glacier. Navigate the main part of the Beagle Channel to enter Pia Bay and disembark near the glacier of the same name. Take an excursion to a lookout point that is ideal for viewing the mountain range where the glacier originates and its flow all the way to the sea. After this unforgettable experience, sail again along the northwest arm of the Beagle Channel through majestic “Glacier Alley”: Spain, Romanche, Germany, Italy, France and Holland glaciers. Sail through the Murray Channel and Nassau Bay to reach Cape Horn National Park to disembark (weather permitting). The mythical Cape Horn was discovered in 1616, and it is a sheer, 425-meter (1,394-foot) high rocky promontory. For many years it was an important navigation route between the Pacific and Atlantic oceans, and it is known as the “End of the Earth”. The park was declared a World Biosphere Reserve by UNESCO in June 2005. In the afternoon, head ashore at historic Wulaia Bay, once the site of one of the region’s largest Yamana aboriginal settlement. Charles Darwin landed here on January 23rd, 1833, during the voyage of the HMS Beagle. This area is also renowned for the mesmerizing beauty of its vegetation and geography. Walk through a Magellanic forest of lengas, coigues, canelos, ferns, and other native vegetation to reach a look-out point. On the Buenos Aires city tour, visit the most famous districts of Buenos Aires, discovering the history and modern life of this world renowned city. The tour provides an in-depth introduction to its architecture, the culture of its people, its anecdotes and secrets. To be put simply, Buenos Aires is exceptional: dynamic, sophisticated and irresistible with an exquisite combination of a European atmosphere and the charm of Latin American cities. Begin at the famous Plaza de Mayo, before venturing out to the old tango districts of Buenos Aires: Monserrat, San Telmo and la Boca. Move on to the busiest areas - Puerto Madero, Retiro and Plaza San Martin - and then, districts with wonderful green spaces and old residences: Palermo and Recoleta. Full-day excursion to an estancia for a typical barbecue lunch and a folklore/gaucho show. Here is where one will learn about the customs of the Argentinean gaucho and his abilities on the horse that will leave travelers breathless. The meat will be cooked “a lo gaucho,” outdoors on the barbecue. Lunch and drinks included. Afternoon, return to Buenos Aires. Duration: 6 hours. Operates every day except Monday. Evening, transfer to the airport to take the flight back home. As the political and cultural center of Chile, Santiago has much to offer. Relax at one of the many jazz clubs scattered throughout the city, or go for a wine tasting at one of the local wineries. Take a guided city trek to learn about the Chilean culture and their traditional meals. Or visit the summit of Cerro Santa Lucia for beautiful views. Known as Chile’s Cultural Capital, Valparaiso has much to see and do. View the enchanting colonial architecture in the historic downtown. Get caught up in the cities artistic and bohemian vibes as you gaze up at the hills covered in brightly colored houses. Visit the Naval and Maritime Museum dedicated to military naval exploits and battles, or dance the night away with the city nightlife. Take a hike through Torres del Paine National Park, located in the southern tiers of the Andes. Catch a glimpse of Flamingos and Guanacos, as you trek one of the hiking circuits, or take a day tour by boat and get an up close look at the surrounding glaciers. Regarded as the southernmost city of the world, Ushuaia has a lot of things to see. Take the End of the World Train to the Tierra del Fuego National Park for hiking on their well-marked trails. Sail around the Beagle Channel view gorgeous views of the mountains, as well as sea lions and penguins. Or visit the Presidio, the museum of the historical military prison of Ushuaia. One of South America’s most stunning cities, Buenos Aires will charm and delight anyone who walks its dazzling streets. Enjoy watching a tango show or visiting the many shopping centers such as Alto Palermo, or Paseo Alcorta. Buenos Aires is also home to several music festivals such as Quilmes Rock, Creamfields BA, and the Buenos Aires Jazz Festival. Enjoy the best rest in this French architecture mansion located in a prime location in the neighborhood of Providencia, Hotel Orly. All the rooms are finely appointed with desk, private bathroom, climate control, cable TV and Internet access. The hotel is also committed to the environment; all rooms have LED lighting and double panned windows. Orly grows its own medicinal herbs available as infusions to be enjoyed in the tea room. The hotel also offers a restaurant serving delicious international cuisine, and daily breakfast in the glass-roofed sunroom. Hotel Plaza San Francisco is located in the center of downtown Santiago, close to the Metro de Santiago and the most important tourist attractions of the city. The hotel has 146 spacious and comfortable rooms in English style, equipped with Wi-Fi, climate control, Cable TV, minibar, and more. The Fitness Club has a full gym, dry sauna, heated pool, and four massage rooms for total relaxation. Restaurant Bristol offers some of the best Chilean cuisine, made with the freshest ingredients from small local farms. Providencia, tucked within the eastern sector of the metropolitan Santiago urban area, gives a warm welcome to a garden city that awaits visitors with hundreds of attractions, landmarks steeped in history and heritage that will surprise guests every day. The hotel offers a beautiful rooftop pool area, bar, and Los Arcos Restaurant serving authentic specialties and wines. The rooms are warmly decorated with calming pastels, and feature Cable TVs, air conditioning, and a minibar. A delicious buffet style breakfast is offered daily. Savoy Hotel Buenos Aires is one of the landmark hotels of the city of Buenos Aires. Its facade and palace style of stunning neo-baroque architecture shows, like very few buildings do, the hopes and aspirations of a comfortable and refined lifestyle that reigned at the beginning of the 20th century. It became the first luxury hotel built in Downtown Buenos Aires. Maintaining its style and sophistication, it currently offers redecorated rooms of absolute modernity and comfort. Personalized attention, gastronomical delights, stories portraits, technological details in all its facilities, art and avant-garde inspiration define the Savoy Hotel Buenos Aires for its excellence. Located in the center of Palermo Hollywood, the true heart of Buenos Aires, this 1904 French Petit Hotel offers the proximity to many restaurants, bars, nightclubs, fashionable clothes, furniture boutiques and antique shops, with the quietness of a human-sized house that respects everyone’s needs. Each of Rendez-Vous Hotel’s 11 bedrooms were neatly decorated with their own colors, materials and theme, following the Feng Shui philosophy in order to bring guests closer to the Argentine spirit. The hotel also offers free Wi-Fi, a delicious breakfast, a lovely solarium, and a 24 hour bar. After a meticulous two-year renovation of a mansion built in 1929 in Santiago, in June of 2016 the doors of Hotel Magnolia opened. The 42-room hotel is the first of its kind in the downtown area of ​​Santiago: a fusion of the city’s past and future, offering historical beauty mixed with luxury accommodations, a gourmet restaurant and a perfect location, At the foot of Cerro Santa Lucía. Carménère ecoHotel, combines rustic charm and modern comforts with an authentic glimpse of Chilean culture and tradition; creating an oasis amidst a metropolis. Located two blocks from ”Alameda”, Santiago’s main avenue, with easy access to three subway stations, we are situated within one of the most desirable locations for tourists in Santiago. The focus is to provide guests with an extraordinary stay, including the finest amenities and unrivaled hospitality and service. Carménère ecoHotel is designed for the traveler who demands excellent service as well as an unforgettable local experience. Ideally set overlooking the beautiful waters of Rio de la Plata, the chic Loi Suites Recoleta Hotel enjoys a prime location in Buenos Aires’ fashionable residential neighborhood of Recoleta. The hotel is positioned within easy reach of Argentina’s famous La Recoleta Cemetery. Loi Suites Recoleta houses lavish guest rooms and suites with an elegant decor, Wi-Fi, and individual climate-control. This premier hotel boasts a large indoor swimming pool area with a cafe, fitness center, jacuzzi, and sauna facilities. Guests can enjoy a free buffet breakfast, sample gourmet cuisine in the hotel’s own La Fuente restaurant or enjoy a refreshing evening cocktail at the sophisticated bar. There’s living and then there’s living the good life. When guests travel to Buenos Aires, Hotel Madero invites them to experience a new concept in hospitality. This luxury boutique hotel provides urban and contemporary comfort for hip, sophisticated Buenos Aires travelers who appreciate a unique sense of style. Guests will find a warm and welcoming environment; friendly, top-notch service, artistic decor; and an ultra-cool vibe. Rooms include chic accommodations, equipped with everything guests need to stay well including an in-room safe that fits a laptop, Wi-Fi, minibar, LCD TV, work desk, and more. Plus, guests can enjoy a complimentary buffet breakfast daily. Located in Buenos Aires city in the heart of Barrio Norte, Design cE faces a green space designed by architect Carlos Thays, where guests can appreciate Sarmiento Palace’s magnitude. Design cE Hotel is an equidistant center of the most attractive places that make the city the cultural capital of Latin America. Each of the 28 suites reveals a new standard in design, technology, and service. All equipped with king size beds, LCD TV 23 inches, acclimatization heat/cold, minibar, microwave, crockery set, bathrooms including whirlpool, security box with laptop capacity, exclusive amenities line, black out with electronic display, Wi-Fi. The style and service of Le Rêve Hotel is inspired by those small hotels in Paris and the world, characterized by delivering unforgettable experience, full of warmth, caring and sophisticated atmosphere, plenty of personal style and details that make an unforgettable difference. The rooms combine a cozy atmosphere with French design, and come equipped with Wi-Fi, flat-screen TVs, air conditioning and other amenities. The hotel offers a delicious, delicate breakfast, and exclusive shop selling art and souvenirs, and a fully prepared staff for any last minute needs. Hub Porteno designs unique experiences for each individual visitor, based on your tastes and expectations, to connect you to the city itself. Our experts are available at any time to guide you on adventures of your choosing in Buenos Aires’ history, art, music, dance, literature, sports, food, fashion and more. The experience includes accommodations in Hub Porteno, which is situated in an unmatched location and provides the best services the boutique hotel industry has to offer. Legado Mitico Hotel is a wonderful combination of old and contemporary, ideal for those who seek the authentic and sophisticated. There is a friendly, cozy atmosphere at this eleven room hotel, with each suite room decorated differently and dedicated to different legendary Argentine characters. Each room has its own full bathroom and is air conditioned with an LCD flat screen television, minibar, and safe. There is a jacuzzi and solarium and internet access. Truly experience the Buenos Aires and Argentine history through the most relevant local mythical figures. Indulge with an exclusive and captivating experience. Sofitel Buenos Aires combines three structures, framing the perfect melange of heritage and innovation. From luxury shopping to cultural events and international business, it is ideally located to enjoy the best of Buenos Aires. It features 140 rooms, 4 event rooms, a Fitness Center, a swimming pool, Le Sud, an international gourmet restaurant, the traditional Cafe Arroyo and La Bibliothèque bar. The rooms and suites, in relaxing tones of ochre and ivory combined with details of Argentine leather, offer an ambiance of sophisticated pleasure. The four elegant meeting rooms and highly qualified personnel make events memorable. Stepping through the stunning six meter-high door made of French oak from wine barrels, on the distinguished Quintana Avenue, at the heart of distinct Recoleta, MIO Buenos Aires stands apart. A blend of daring design, comfort and meticulous service with state-of-the-art technology stands out as a fusion of luxury, high-tech functionality and pleasure. Fine materials such as calden wood, glass, cotton, oak, steel, marble and silk, all combine beautifully to create a unique aesthetic that stands apart in each and every one of the thirty rooms and suites, and places MIO Buenos Aires at the forefront of design sophistication. Become immersed in the authentic surroundings and the splendid views of the Andes Mountains at The Ritz-Carlton, Santiago, a luxury hotel inspired by the fertile land on which some of Chile’s finest vineyards flourish. The fruit of these vines infuses the most memorable of guest experiences, including daily wine tastings with an expert sommelier and food and wine pairings in its acclaimed restaurants. Enjoy the beauty of this geographically-gifted destination graced by both sand and snow. The hotel offers a gorgeous rooftop health and fitness center, luxurious guestrooms and suites, and unmatched culinary experiences at 5 on-site restaurants. Casa Bueras Boutique Hotel (formerly known as Lastarria Boutique Hotel) stunning was built in 1927, located in the heart of Santiago´s most bohemian borough, has been renovated and converted into a superb boutique Hotel with unrivaled personal service to ensure guests stay in a genuine home from home. Situated in an area brimming with history and surrounded by the best museums, galleries, trendy shops, antique stores, cinemas, theatres and innovative restaurants, this boutique Hotel offers guests the chance to discover the tremendous diversity of the city on their doorstep. The hotel offers bar and lounge, fitness room, Wi-Fi, complimentary breakfast, and the fabulous Deli Lounge Restaurant. At the heart of the city’s most diverse, culturally rich and upscale district, it’s always viva la vida at W Santiago, an icon of style and sophistication where all the hot action begins under the cool peaks of the spectacular Andes. Colorful Chilean character emanates in every corner. An oasis of urban utopia where indulgence begins at 3 restaurants that redefine Chilean bistro dining amid scintillating settings. Guests can get their beauty on at The Boss salon, light up the night at Whiskey Blue Lounge, or relax at rooftop Red2One. The state-of-the-art spa and fitness center will rejuvenate the body and soul, before taking an exciting plunge into the WET® infinity edge pool. The Singular Santiago combines the style of early 20th century buildings with neoclassical French architectural influences. The result is a striking new addition to the Santiago cityscape. The interior of the hotel recalls the days of yore. Each doorway is a portal not just into another room, but to another place: a Singular setting with an ambiance all its own. Enjoy the endlessly indulgent Spa. The superlative dining experience at the Singular Restaurant. Refreshing cocktails in the ninth floor. Step out onto the elevated terrace, for a spectacular view: the Parque Forestal, an arboreal escape right alongside the hotel, and enjoy the Roof Top Swimming Pool. Set on 100 acres lining the Fjord of Last Hope in Puerto Bories, in the surroundings of Puerto Natales, The Singular Patagonia affords guests the opportunity to experience all Chilean Patagonia has to offer – the true Patagonia. The rooms each offer an en-suite, spacious bathroom with a separate bathtub and shower, not to mention a Minibar, complimentary Wi-Fi and satellite TV. The hotel’s modern restaurant serves gourmet, traditional Patagonia food made with fresh local ingredients. Guests can also enjoy the tranquility of the Singular Wellness & Spa, offering and indoor and outdoor heated pool, sauna, steam room, multi-jet Jacuzzi, and massage and facial treatments. Algodon Mansion is a luxury boutique hotel nestled in the heart of Buenos Aires’ most elegant residential neighborhood, Recoleta. The luxury suites are exceptionally spacious and offer superior comforts and amenities. Algodon Mansion prides itself on absolute attention to every detail in personalized service, in order to create a sublime hotel experience. The award-winning wines and fresh farm products from our Mendoza winery, Algodon Wine Estates, are featured prominently on the restaurant’s menu. The hotel also offers an oasis in the sky at their rooftop pool, with teak decks and loungers. Park Hyatt Buenos Aires introduces guests to one of the world’s most stylish and cosmopolitan cities. Perfectly located on Avenida Alvear, in the heart of the French heritage district of Recoleta, Palacio Duhau – Park Hyatt is one of the finest Buenos Aires hotels. Discover all that Palacio Duhau Park Hyatt has to offer. This visually arresting landmark holds its own in the eclectic Buenos Aires skyline by blending the 1930’s charm of the French Palacio Duhau with contemporary design and decor. Situated in a residential neighborhood surrounded by luxury boutiques, guests are welcomes to savor a unique and relaxing travel experience in the beautiful gardens or private art gallery. The Alvear Palace Hotel is situated in the most elegant neighborhood of Buenos Aires, La Recoleta, where some of the best restaurants, cafes, antique shops and boutiques of Buenos Aires, are to be found. The Alvear Palace was transformed in 1932 into a model of the highest expression of refinement. The majestic rooms and suites, as well as the lobby and public areas, are reminiscent of the Louis XV and Louis XVI styles, which are evident in the furniture, the crystal chandeliers, walls decorated with gold leaf and works of art of famous artists. The eleven-floor luxurious building with five basement levels stands as an undisputed symbol of the city. We really enjoyed all the hotels and the tours you recommended! Thanks for checking in. We had an excellent time in Chile and Argentina. Everything worked out perfectly. It was very comforting to have someone meet us in each city and facilitate our tours, while allowing us plenty of time on our own. All of the transfers and pick-ups were perfectly on time and were with very kind and helpful guides and drivers. Our only problem was in Chicago on our way home when our flight was cancelled, but there was really nothing anyone could do at that point. Otherwise everything was great! We really enjoyed all the hotels and the tours you recommended and look forward to working with you again in the future. Thanks again! I had been promising myself this trip to Patagonia for some years and am happy to report that it has exceeded all my expectations. I had a truly fantastic time in Chile and Argentina. The trip went like a dream with absolutely no hitches. I had been promising myself this trip to Patagonia for some years and am happy to report that it has exceeded all my expectations. Thanks for putting together a great itinerary for me and taking the hard work out of planning my vacation.I will be in touch to seek your help planning my next trip to south-america whenever that may be. Patagonia camp was gorgeous and the guides there were truly great outdoorsmen. I am emailing you to tell you that we had the trip of a lifetime! Santiago & Buenos Aires are beautiful and Patagonia was amazing! But most of all the guide in Chile was an open book. My sister and I actually thought he was a university professor moonlighting for some extra money. That is how knowledgeable he was about Chile. They were all great but he truly stands out as exceptional. Our time in Argentina was also amazing and the only problem we encountered is that we want to go back- and soon. Patagonia camp was gorgeous and the guides there were truly great outdoorsmen.